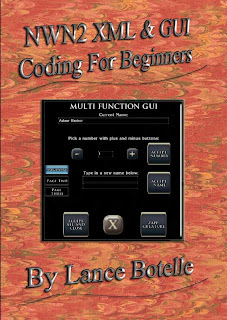 I have finished tidying up the last few sections of the PDF manual for the "NWN2 XML & GUI Coding for Beginners" today and having made one last check of the demo module that supports it, I will now upload it to the Vault. As soon as the link to it becomes available, I will attach a link to the left pane of this blog. This blog entry will be the official area for people to leave any comments about the tutorial if they wish to. I've gone through a third of it so far, just out of curiosity, and it has really given me the feeling that custom gui's are not that hard to do. Thanks for opening up a whole new aspect of NWN2 modding for me. That was my goal: To show that the "basic ingredients" are probably all we need to make reasonable GUIs that add something interesting to our modules. Keep me updated on how you get on. I'm glad you enjoyed the tutorial. It sounds like you are quite familiar with XML in general already. :) If the tutorial helps in any way, that's good to hear. I know this is a bit late, lol, but how do I make buttons bring up more gui? I made the button attached to the inventory, and Ive made the gui that it needs to bring up, but I can't figure out how to make the inventory button trigger the new gui can you please help? "I know this is a bit late, lol, but how do I make buttons bring up more gui? I made the button attached to the inventory, and Ive made the gui that it needs to bring up, but I can't figure out how to make the inventory button trigger the new gui can you please help?" 3) Once steps one and two are confirmed to be working, simply add extra code to your "debug script" that sends the message to the player to open the GUI as well. Things to look out for (FAQ) are covered in the manual at the back. 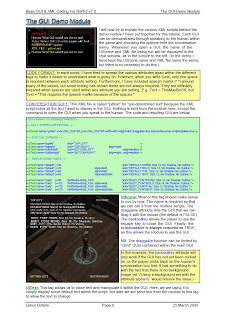 Alternatively, post your XML and scripts in the Bioware forums so I (and others) can take a closer look for you and let me have the link. The key thing is to test such systems in stages. Hey there, Is there a way to display a player's "Skill Rank" as text? I am not sure in what context you are asking this question. However, you can use the function IntToString to change the int to a string and after using it on the function that calls the Skill Rank in the first place. I visit those forums on occasion myself, and there are many people who will help you there too.